ESBA's Brussels office works to ensure that SMEs' voices are heard by EU policy makers on a daily basis. The Brussels Secretariat, consisting of an international team of experienced EU representatives, serves its member organisations by keeping them abreast of all relevant and up to date EU information, regulatory initiatives and EU programmes by constantly monitoring the Brussels arena. On the basis of close and regular contacts with its member and by means of a bottom-up approach, the Brussels Secretariat identifies issues of key importance to its members and coordinates campaigns to represent the interests of small business entrepreneurs and the self-employed at EU level. 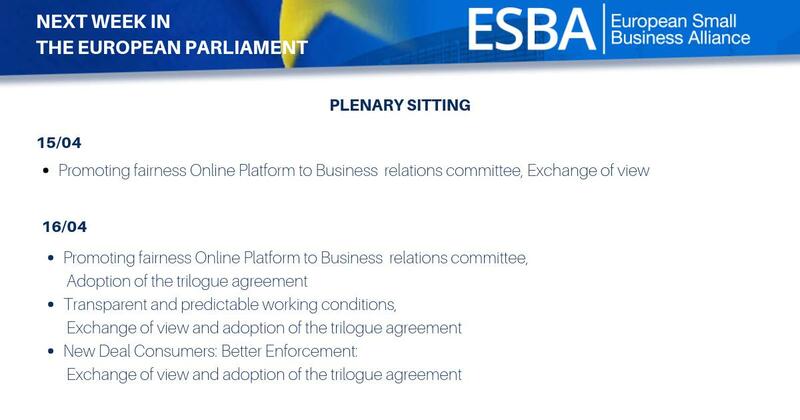 It coordinates the representation of ESBA in relevant EU consultations and political fora. It maintains regular contact with EU media to profile its ideas and positions on all issues affecting the business environment of SMEs and, most importantly, it engages in constant dialogue with decision-makers in all the relevant EU Instututions. The Brussels Secretariat also maintains close contacts with other business organisations in Europe, which enables it to form strong alliances where needed, facilitating increased political influence on key business issues. The Brussels secretariat is available at all times for inquiries by its members and their members respectively.